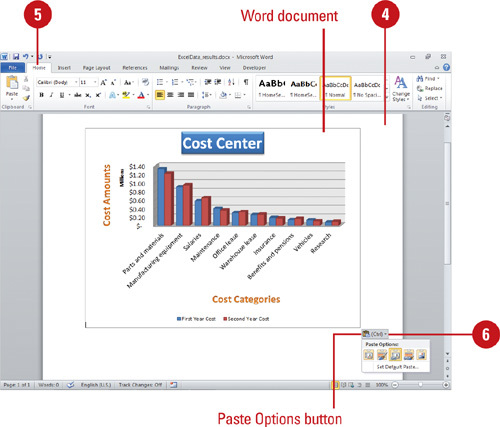 A common pairing of Office programs combines Word and Excel. As you write a sales report, explain a budget, or create a memo showing distribution of sales, you often want to add existing spreadsheet data and charts to your text. Instead of re-creating the Excel data in Word, you can insert all or part of the data or chart into your Word document. You can use the Object button on the Insert tab or copy and paste the information from Excel into Word. The Paste Special command allows you to specify how you want to paste external information into Word. After you insert data or a chart into your word document, you can double-click the embedded Excel object to modify the data or chart. Click in the Word document where you want to copy the Excel range. Click the Object button arrow, and then click Text from File. Click the Files of type list arrow, and then click All Files. 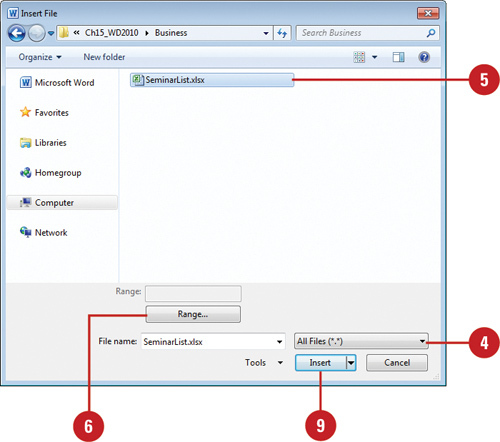 Locate and select the file name of the workbook you want to copy. Specify the range you want. You can name a range to make it easier to use in Word. If you plan to insert part of an Excel worksheet in a Word document, name the range. This is easier to recall than the specific cell references. Check Help in Microsoft Excel for details. Open both the Word document and the Excel worksheet that contain the data you want to link or embed an object. 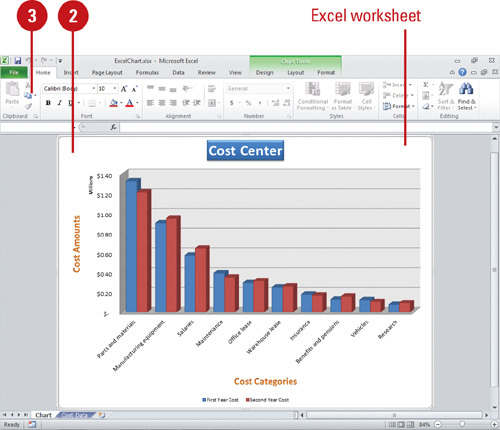 Switch to Excel, and then select the entire worksheet, a range of cells, or the chart you want. Click the Home tab, and then click the Copy button. Switch to the Word document, and then click where you want the information to appear. Use either of the following methods. Paste. Click the Paste button, click the Paste Options button, point to a paste option icon to display a ScreenTip with the function name and display a preview of the data (New! ), and then select an option. Paste Special. Click the Paste button arrow, click Paste Special, click Microsoft Excel Worksheet Object, and then click OK.
You can import Excel data as a picture. Data inserted this way becomes a table that you cannot edit. Select the data you want to import, click the Copy button on the Home tab. Click in the Word document where you want to insert the picture, click the Paste button arrow on the Home tab, and then click Picture. Drag the picture to a new location, or drag its resize handles to enlarge or shrink it.